Not long ago, each region had a largely self sufficient economy. People themselves manufactured what they required and thus every village or town had its own set of artisans, who specialized in different crafts. This is especially true about Chamba. As we know, Chamba is enclosed by gushing rivers on one side and high mountains on the other. In olden days, when there was hardly any good road, ordinary people rarely went out for marketing purpose. They had to use what was locally available. This had twofold outcome. Local art and craft had a tremendous growth. Moreover, artisans from different regions came to settle here. 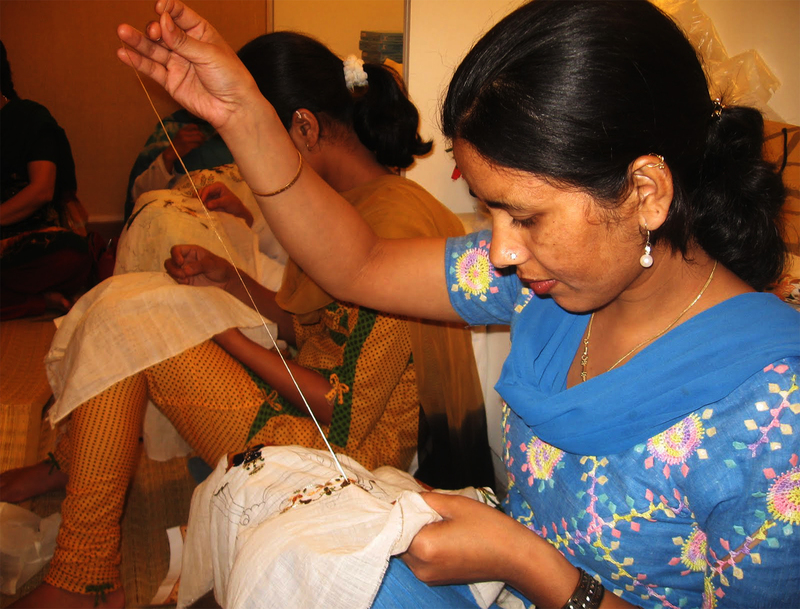 They taught new techniques, which the local artisans assimilated in their modus operandi; thereby enriching the art and craft of Chamba. Artisans of Chamba make all kinds of useful articles; however, instead of manufacturing simply a functional piece of object they have been able to turn them into beautiful pieces of art. Indeed, their inherent sense of beauty turned the simple objects into museum pieces. Royal patronage also played an important part in this. The footwear industry in Chamba is highly developed. Although it is one of the indigenous crafts of this region, there is an interesting story behind it. It is said that, long ago, chappals were mostly made of grass; leather footwear was not in vogue then. Things changed when a princess from Kangra (some say it was Kashmir) was married into the royal family of Chamba. She was not happy with the grass slippers made by the local craftsmen and so a cobbler family was sent to Chamba from her native land to make shoes for her and this is how leather chappals began to be made in Chamba. Today however, both leather and grass slippers are being made here. Grass slippers are used where leather footwear is not allowed. Earlier, only locally available goat or sheep leather was used for making the leather chappals. With time different types of leather began to be imported for making different types of footwear. Some of these chappals are plain; they are mostly made by men. Another variant is elaborately embroidered with silken threads of various colors. These chappals are also made by men, but the embroidery is done by women artisans. In general, the embroidery is done on a separate piece of felt using brightly colored silk yarns known as Chamba Kadhai and a hooked needle. Gold and silver threads known as russi tilla are also used. These embroidered felt pieces are then pasted or stitched on the chappals. The footwear so made is not only beautiful, but also very comfortable and sturdy. National Footwear Institute is now trying to brand these slippers for export purposes. They are also keen to provide training to the artisans so that they can make export oriented footwear. Chamba rumals refer to a visual art form done on handspun cloth using untwisted silken thread known as ‘pat’. Such pictorial embroideries, which are unique to Chamba, originated in royal quarters somewhere in 17th and 18th century. In those days, the walls of the palaces were decorated with murals and miniature paintings done in Chamba style. The ladies of the royal household recreated those motifs on unbleached khaddar; muslins and silk cloth; may be just to pass some leisure hours. Today this art has become a hallmark of Chamba. Before commencing the work, the ladies had the outlines drawn with soft brush. In most cases, female miniature painters were hired to do this job. Sometimes of course, the ladies themselves did this job. Those done by the royal ladies were comparatively cruder and bolder. Today, the craft is no longer confined to royal quarters. Commoners have taken it up in a big way. The initial sketch is drawn with charcoal. Do Rukha or double satin stitch is mainly used to fill up this sketch. Darn stitch or Du Rukha Tanka is also used where appropriate. The stitching is done in a way that the fabric looks similar on both sides and enables a photo like finish. The most popular colors used are Persian blue, ultramarine, carmine, deep red, pink, brilliant pink and purple, parrot green, lemon, deep yellow, brown, and black. Shawls are another important handicraft in Chamba. Earlier the shawl makers used mainly local sheep wool to make these shawls; but today, merino sheep wool, pashmina wool, angora wool etc are used. Sometimes, cotton thread is also used along with woolen thread. In general, such shawls have a bright border and traditional designs. 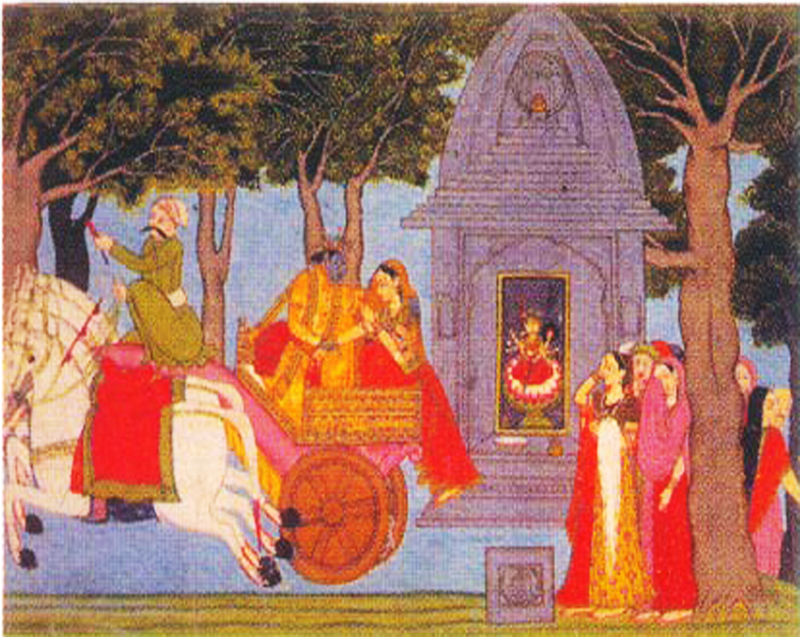 The art of miniature painting in Chamba probably started in the 18th century after the death of Aurangzeb. As there was no strong ruler after him, the influence of the Mughal Court began to decline and the artisans began to disperse due to lack of patronage. Raja Umed Singh of Chamba invited some of the painters to Chamba and provided state patronage. In Chamba, those painters began to paint pictures based on different mythological tales and their work began to be known as Chamba paintings. However, from the end of 18th century, the Sikh influence in the facial features and color schemes became clear in these paintings. The influence of other school of paintings prevalent in the hills is also very apparent in them and so they began to be considered a branch of Pahari Paintings. This branch of visual art continued to flourish in Chamba into the 19th century after which it began to decline. However, it did not die. Chamba paintings are still alive in some traditional form, required in different socio-religious occasions. For instance, such paintings can be observed on both sides of the door during wedding ceremonies. In addition, there are quite a few well known painters in Chamba who continue to practice this form of even to these days. Metal work is an ancient craft of Chamba. It is believed that the people of this region have been making brass objects long before King Maru set his foot here. A copper mine located in the district provided the raw materials for making the brass. Later, bronze items began to be made under influence of Kashmiri artisans. The images of many gods and goddesses in the district have been made with bronze in the later period. To make these images, artisans first made the mould with wax and then applied a thin layer of earth on it leaving a hole on the top. The mould was then burned and finally the melted bronze was pored through the hole. Once cool, the image was taken out and finer details were chiseled. Apart from such cast metal work, artisans also made different objects with sheet metal. The art is very much in vogue today. Modern artisans make small and medium art objects in their studio. Prakash Chand, Ramesh Chand, Hakam Singh are some of the more popular sculptors of Chamba. Wood carving is another traditional art of Chamba. This craft goes back to 7th or 8th century AD. The temples of Bharmour and Chattrari are good example of such craft prevalent at that time. Wooden statues, door panels and under-the-eve decorations from later period also provide significant insight into the importance of this craft. Even today, there are quite a few well known craftsmen in Chamba, who carry on this tradition with acclaim. Mohammad Latif is one of them. He had received National Award for his contribution in the field of wood carving in Chamba. Musical instrument making is another major handicraft practiced in Chamba. Artisans of this town make different kinds of instrument in their studios by hand even to these days. Among them horns or singas are very important. They make both straight and carved varieties. Kettle drums known as nagaras, different types of bells (plain and engraved) and cymbals are some other popular items made here. Other than the above mentioned handicrafts, there are few others, which are equally important. Among them we can mention jewelry making, weaving, basketry and pottery etc. The jewelries are commonly made with gold and silver. The designs are mostly traditional and have been handed down from generation to generation. Influence of other cultures is also evident in these designs. Weaving is another ancient craft of this region. It was earlier confined to a certain caste and the technique was handed down from father to son. However, the craft has now been picked up by people belonging to other castes as well. Basketry is another popular craft in Chamba. It is generally made by village women. They adopt various methods such as coiling, plaiting, intertwining and interlacing to produce many useful items like baskets, trays and bowls. Potteries in Chamba are mostly made by Kumahar caste. However, in spite of being functional, the pots made by them are so very beautiful, that the makers are often called Prajapati after the creator of the world Brahma.